It was a very hot summer day when the air stood still and made me feel as if I was suspended in a bubble. My body felt heavy; lifting my arms was difficult. For the first time in my life I was completely aware of my body not functioning properly. While crossing the lawn at the back of my grandparents’ house, I felt a breeze touch my cheeks and a sigh of relieve came with my next breath, it made me walk quicker to get into the shade of a big pear tree in the corner of the yard. Looking up into it’s fruit laden branches with the sun blinding my eyes I could see the branches silhouetted against the sky in a dark mass of bending lines. The leaves looked pale in the bright light and reflecting the occasional water droplet still waiting to be evaporated by the sun’s rays. The golden pears were hanging off the branches like bags of gold, so heavy that they seemed ready to break loose any moment. One fell to the ground splattering its juices like a fountain. It fell just in front of my feet covering me with its sweet and fruity flesh. Scraping up the incredible sweetness off the ground and filling my mouth with its goodness made me feel thirsty for more. I was only 7 years old! There are over five thousand varieties of pears grown throughout the world in temperate climates. The best tasting pears come from France and in the United States most of the crop comes from California, Oregon and Washington. Pares range in shape from spherical to bell-shaped, and in color from celadon green to golden-yellow to tawny red. Ripe pears are juicy and depending on the variety, can range in flavor from spicy to sweet and to tart-sweet. The pear is easily bruised and therefore is better if it is picked green. The flavor will improve when you let it ripen at room temperature and then refrigerate the ripened fruit. Choose those pears that are fragrant and free of blemishes and soft spots. It is not necessary to peel the pear before eating, but if it is peeled then brush it with lemon juice, as he pear’s flesh quickly browns. 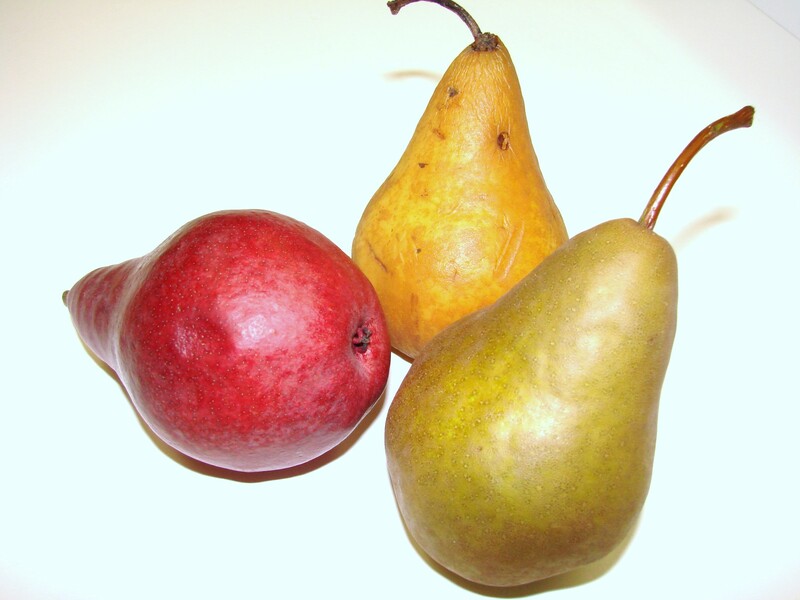 Bartlett is the most commonly found pear in the United States and therefore most popular. Its season is from late July through October. This pear was developed in the 18th century by and an Englishman and introduced to America by Dorchester, Massachusetts resident Enoch Bartlett. Comice is the best pear for eating; it is fine-textured and has a juicy flesh with an aroma similar to wine. The best Comice pears come from Oregon and northern California. They are available from October to January. 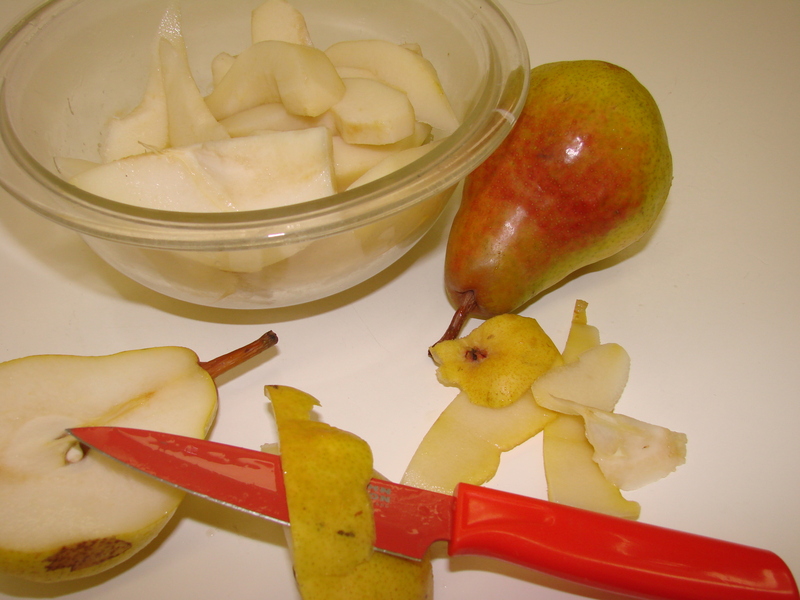 Bosc is a winter pear and the most practical to cook with. 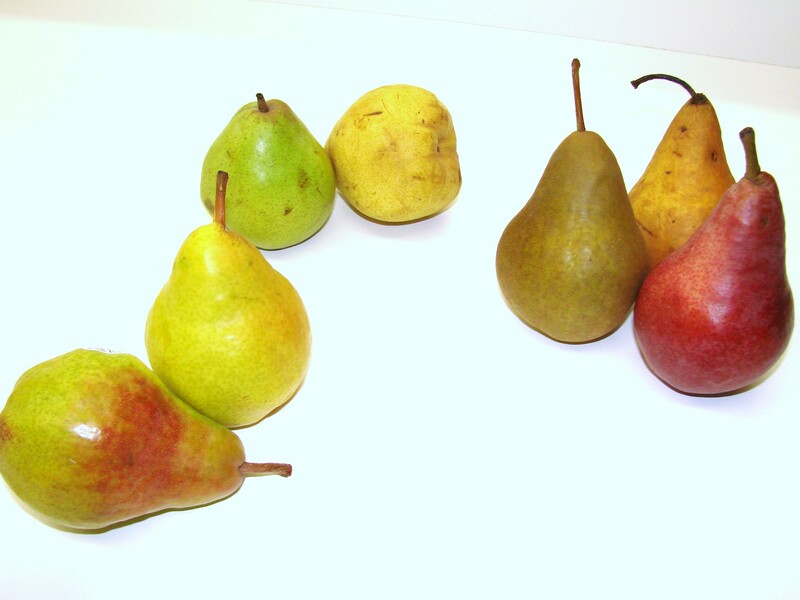 It’s russet color will yellow somewhat when completely ripe, but will not soften like other pears. To test for ripeness squeeze the long, graceful neck for tenderness. When fully ripe it is very sweet and full of fragrance. It holds its shape well when baked or poached. It is available from October through April. D’Anjou is widely grown in the US. It is the least flavorful of all the pears, but it keeps the longest. It is available throughout the winter months, from October through mid-winter and is very good for cooking. Our Austrian friends in Kapfenberg, Steiermark, often invited us on Sundays for Nachmittag’s Kaffee. The Keffee and Kuchen was served in an Arbor, shading us from the afternoon’s son. 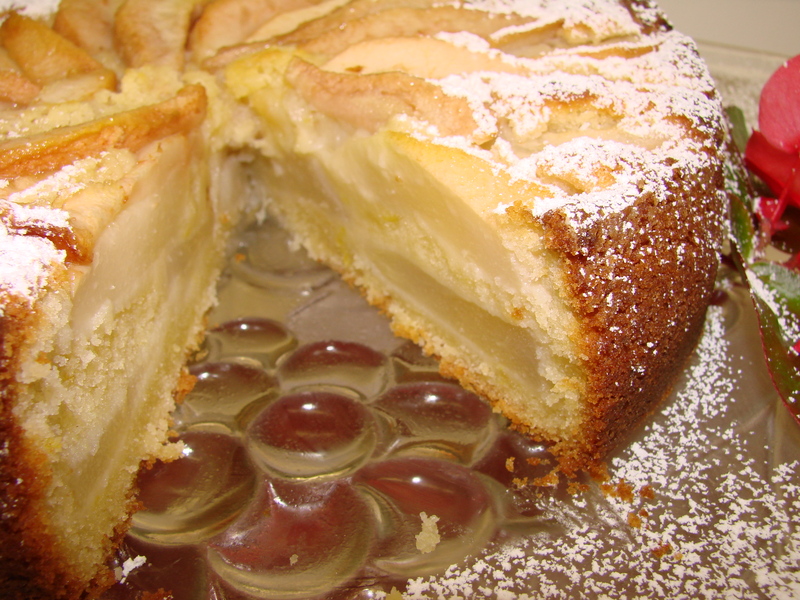 On one of those Sunday’s Tante Paula serve a Birnen Kuchen, a Pear Cake. 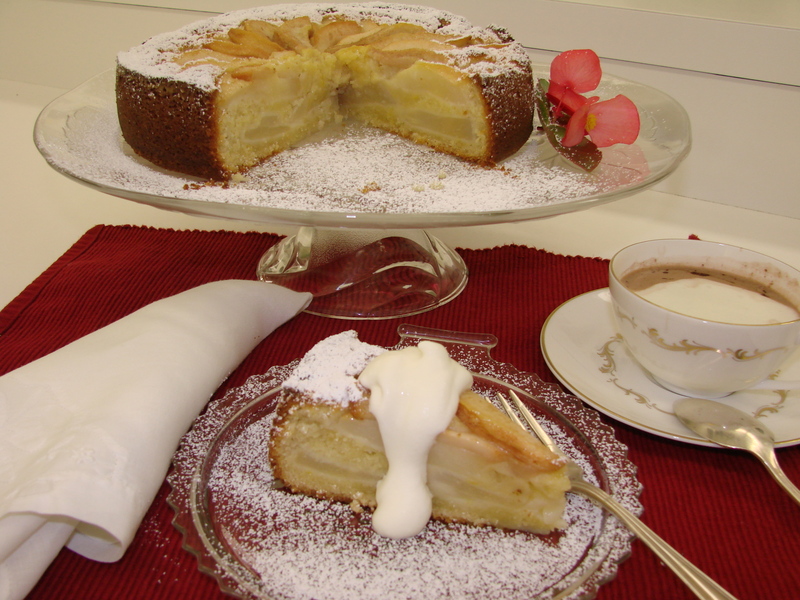 Many years later here in America I came upon this Pear Cake recipe in a German Magazine, and it has become one of my very favorite cakes. Every time I make it I remember with fond thoughts the kindness and love these friends extended to us, the refugee family from Croatia. Prepare an eight inch spring form by greasing and dusting it with flour. Peal the pears and slice each quarter into three sections. In an electric mixer or hand mixer beat the butter and sugar until very light in color, and very fluffy. Add the eggs one at a time. Add the zest of the lemons and Vanilla. Mix the flour with the baking powder. Add the flour mixture to the butter, sugar and eggs alternating with the milk. Mix well until it becomes a smooth, soft dough. Transfer half of the dough to the spring form and smooth it onto the bottom of this baking pan. 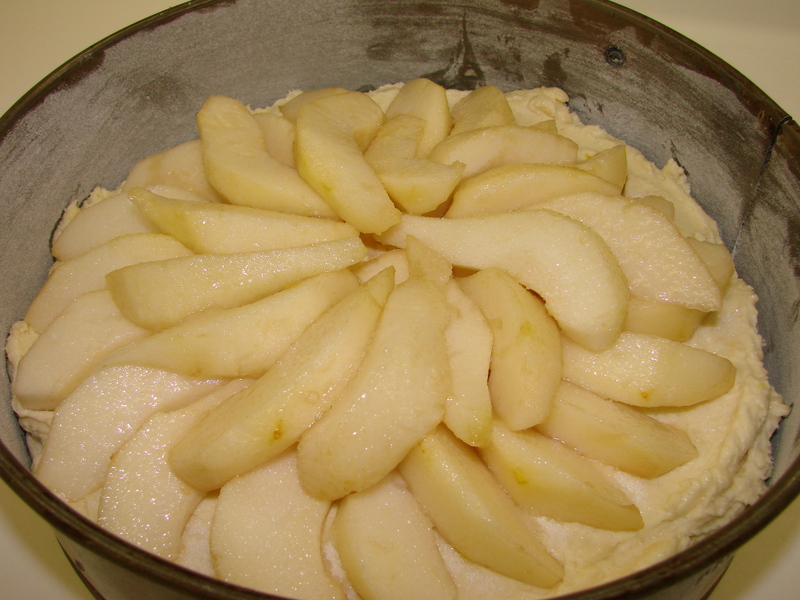 Add half of the pear sections in a circle starting around the outer edge of the pan until you finish in the middle. 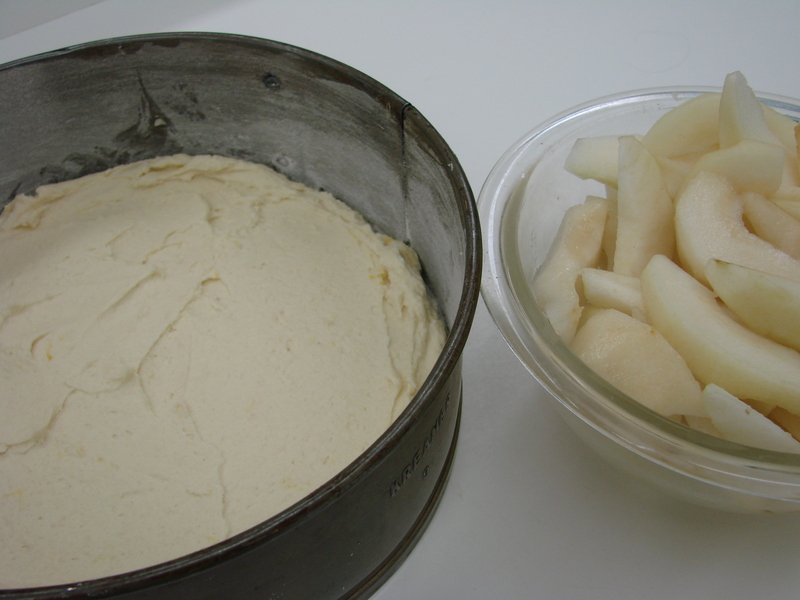 Add the rest of the dough on top of the pears, smooth it out and add another layer of the pears on top…the same way in a circle until you finish in the center. 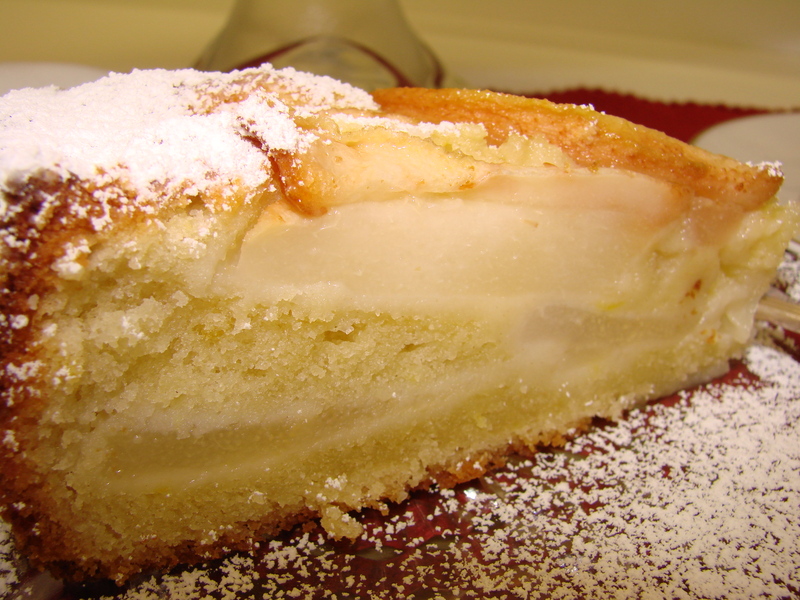 Be generous with the pears it make the cake pudding-like, moist and delicious. Bake the cake at 350 F for about 1 hour and 15 minutes…..or until a toothpick come out clean. Cool the cake completely then transfer it onto a serving platter. Make the Lemon Glaze with the above recipe…..it is really delicious. Softly whipped heavy cream sweetened with powdered sugar….before serving. Drizzle the cake slices with honey just before serving. I have tried all three versions, and I cannot tell which one I like best…..actually it all depends on what you have in the refrigerator or the pantry………..I have not tried dribbling a warm chocolate sauce over the slices , but I think I will try it the next time I make this wonderful and versatile cake. Because with each topping it actually becomes another pastry. If you make the cake a day ahead of when you want to serve it…you can leave it on the kitchen counter – covered loosely with wax paper. Share with me one of your favorite fruit pastries, especially if it has a story connected….I would love to hear from you! As usual your story makes the yummy cake more delicious! 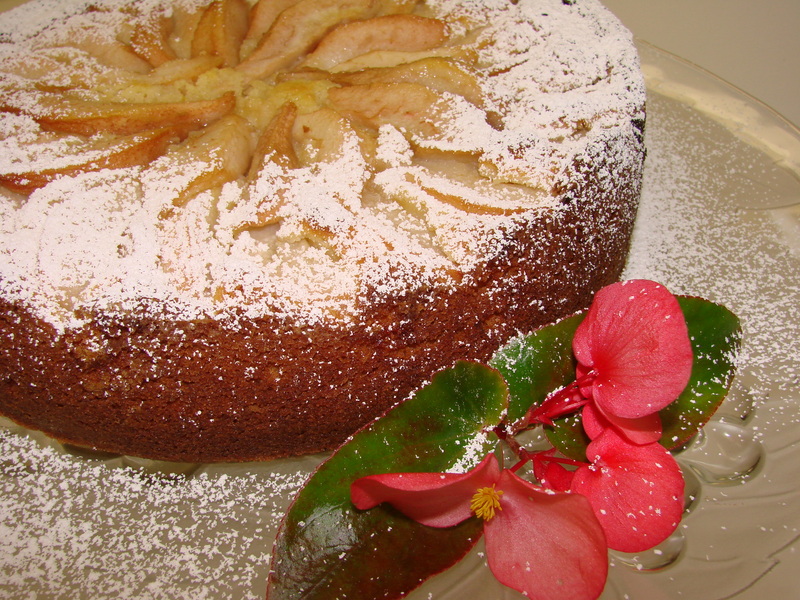 An incom-pear-able account Maria that is both enjoyable and informative, leading one into the delightful recipe. My mother is from Germany and I am reminded of her plum cake, which is a flatter preparation, but with plums laid out on top. A lovely post as always. Always nice to read about the colorful stories of your past and the connections to the “fruits of your labors” now. The pear is a favorite but I do not purchase them very often. They do not seem to be ripe enough for me from the store. I, too, had an experience of a pear tree in someone’s yard at a young age and my stomach grew full from the golden fruits just before I fell from the tree. I would do it all again as I remember that taste of sundrenched pear at it’s peak of perfection. Wonderful information, as always Maja! Linda……….so nice to hear from you …..thank you for stopping by……….and sharing your pear story was great fun to read…. Deb……….how wonderful to hear from you???!!!!!!!! Thank you for your nice words and I too feel that I am blessed to have you as my friend….You are one of my friends I LOVE to laugh with……..
Hugs to you with love……….. This cake sounds wonderful! I can’t wait to make it. from – Barbara Cummings……………via email……. 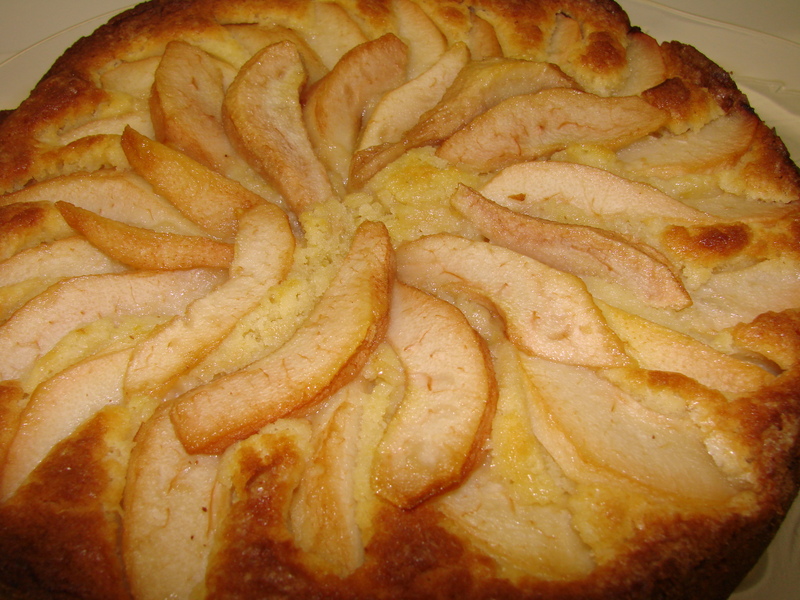 The pear Cake looks awesome! Beautiful words, loved reading your account from when you were a child. I’m about to pick up all these ingredients right now, very excited, and anxious, yours look great! I prepared a half-recipe in a 6-inch spring form pan, as there are just the two of us. I can’t wait to see what it tastes like tomorrow. It will be hard to wait! I look forward to preparing more of your recipes.